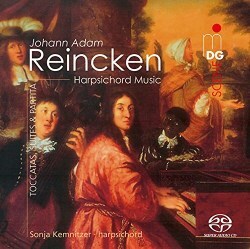 Johann Adam Reincken is one of the better-known names from the 17th century. His fame is largely based on his connection to Johann Sebastian Bach. The latter arranged some of Reincken's instrumental works for harpsichord. When Bach travelled to Hamburg in 1720 he improvised before Reincken, who was deeply impressed that the art of chorale variation, FOR which he himself was famous, lived on in the young organist. There is a second reason that Reincken is well known: the fact that he was almost 100 years old, when he died. That is to say: for a long time 1623 was assumed to be the year of his birth. However, later research cast doubt on this assumption, and today it is thought that 1643 is a more plausible date. Because of the story about Bach playing before Reincken, the latter is almost exclusively connected to the organ. However, he was one of the founders of the opera and was one of its managers from 1678 to 1685. His oeuvre includes a collection of sonatas which were printed in 1688 under the title of Hortus musicus. In addition he wrote some treatises about composing and harmony. The largest part of his oeuvre comprises music for keyboard. The number of pieces exclusively intended for the organ is very small which is not surprising, considering that improvisation was the main task of a church organist. The present disc focuses on his output for a strung keyboard instrument, harpsichord or clavichord. The latter was a very common instrument in Germany, especially among amateurs. The harpsichord oeuvre comprises at least eight suites, some toccatas and two sets of variations. The toccatas can also be played at the organ. The goûts réünis - the mixture of various national styles - is often associated with the 18th century, when composers like Telemann and Bach included elements of the French and Italian style and mixed them with the German contrapuntal tradition. However, the 17th century already saw something comparable, as the keyboard oeuvre of Reincken demonstrates. The toccata had its origin in Italy: around 1600 various composers started to write such pieces for organ, and one of the most famous composers of toccatas was Girolamo Frescobaldi. They are typical specimens of the so-called stylus phantasticus: sequences of short, contrasting sections of an improvisational character. This form was embraced by representatives of the North German organ school. They added something of their own: the inclusion of fugal sections which gradually resulted into a division into five sections: toccata - fugue - toccata - fugue - toccata. This is a clear token of the mixture of the Italian style with the German contrapuntal tradition. Johann Jakob Froberger, who was a pupil of Frescobaldi, also played a key role in the dissemination of the toccata to Germany. Sonja Kemnitzer, in her liner-notes, observes various similarities between Froberger's and Reincken's toccatas. She also points out that the latter's toccatas have influenced Bach's toccatas for harpsichord (BWV 910-917). The contrasts within Reincken's toccatas not only come to the fore in the inclusion of fugal sections, but also the presence of recitativic passages. These pieces are quite virtuosic and require nimble fingers, also because of the frequent passage work. The suites refer to French influence. Again, it was Froberger who was partly responsible for the dissemination of this form. He had inside knowledge of what was composed in France, for instance by Louis Couperin. The basic texture of the keyboard suite in Germany can be attributed to him. Reincken follows it in all his suites: they consist of allemande, courante, sarabande and gigue. Again German composers added an element of their own: a thematic connection between the dances. That was not the case in French music: performers were allowed to pick and choose pieces in a specific key and put them together to a suite. The contrapuntal tradition makes itself felt here as well, for instance in the fugal gigue from the Suite in G. It is notable that several forms were sometimes mixed. That goes here for the Suite in C: the sarabande is based upon a chaconne, one of the most popular bassi ostinati of the 17th century, and mostly used independently. That mixture also comes to the fore in the variations on Schweiget mir vom Weiber nehmen. This is a series of 18 variations on a song which was quite popular at the time and which is about the trials and tribulations of marriage. The last four variations are in the form of a suite with the four dances mentioned above. Froberger did the same when he composed nine variations on this same melody, albeit with a different text (Partita auff die Mayerin). Buxtehude used the form of the suite for his variations on the chorale Auf meinen lieben Gott. Reincken uses this simple melody for increasingly brilliant variations. It bears witness to his own skills at the keyboard. He was highly reputed for a good reason. This disc offers a good opportunity to become acquainted with Reincken's art. Sonja Kemnitzer plays a most appropriate instrument: the copy of a Ruckers of 1624. She delivers solid performances but not the most imaginative. In the long run I found her playing a bit wearisome, largely because a lack of differentiation. I compared the variations with the recording by Léon Berben which I found much more engaging and imaginative. The same goes for the toccatas and the suites which are a bit too much straightforward. There is also too much legato; I would have liked more differentiation between good and bad notes and missed some breathing spaces.